The Palm Course is generally the course of choice amongst lower-handicapped players. It features a large number of challenging water hazards. 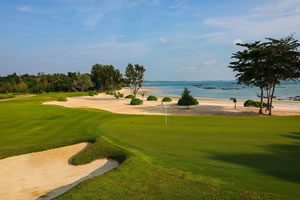 The venue of the Asian PGA Championship in 1997 and 1998, the Palm Course is often referred to as a 'thinking golfer&apos;s' course. A par 72, it measures 6,072 metres from the blue tees. 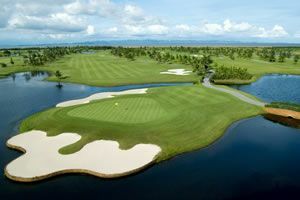 It offers undulating fairways, as well as strategic bunkers and water hazards. The emphasis here is on well placed drives which will be rewarded. On the other hand, playing wildly will be disastrous. This, combined with lush, lavish greens, tranquil waterways and the panoramic surrounding landscape create a course that is as picturesque as it is challenging. Have you played golf at the Raffles Country Club, Palm Course and took some nice photos that you would like to share with other golfers? Send them to us and we may upload them here. Thank you in advance!